Software Engineer and fashion blogger Donna Pinto is my neighbor/college roommate and best friend. She is the author of the blog dpinstyle. She is a big fan of murder mysteries, Harry Potter, knitting and of course living well. Her charming flat is a beautiful exhibit of the revived glamorous victorian with clean modern pieces. 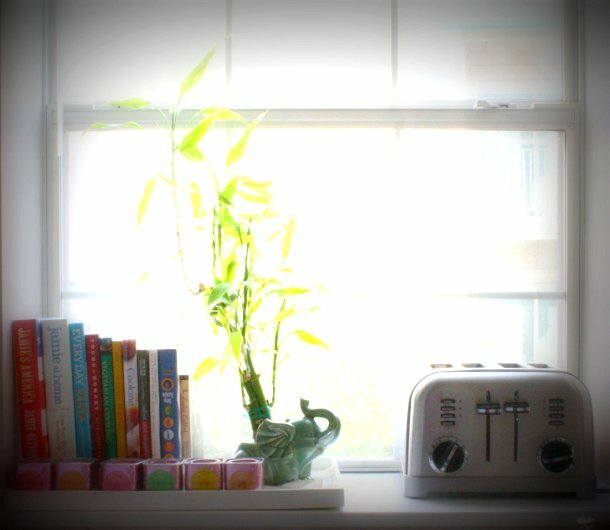 The fist image is of her living space which she aptly separated with a backless bookshelf from the entry space. This is a great substitute to room dividers. The bookshelf is from Ikea. Her plush tufted pink chesterfield is admirably juxtaposed with reupholstered midcentury arm chairs. Natural woven rugs can tie any space together. Nine identical photo frames tile her wall with vogue cover pages. 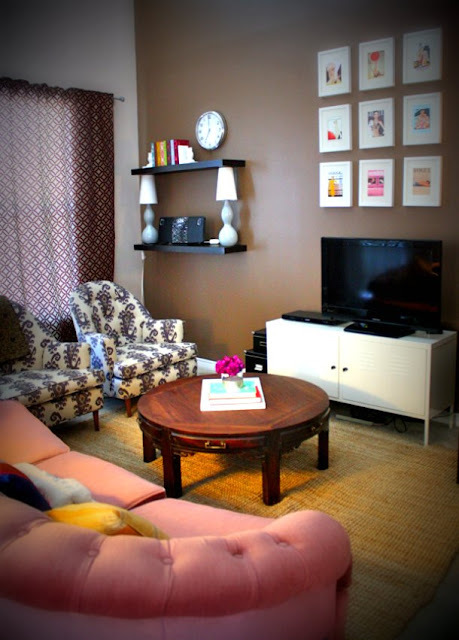 The round coffee table is from Craigslist, and the sofa is from the Salvation Army store. The flat brims with light from large windows all around and the private quarter is upstairs separated from the living space. 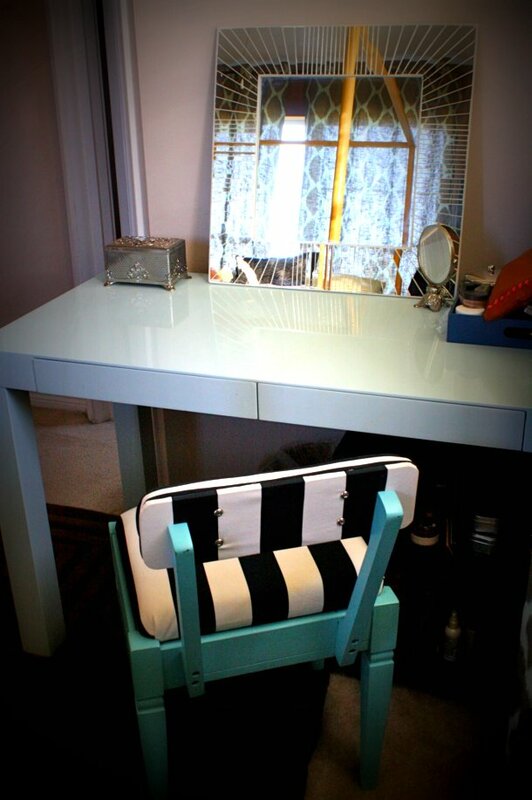 Her vanity is a modern sleek table with a small elegant chair that she refinished herself. The mirror is a Home Goods find. This exquisite nightstand is a Craigslist find and then given a charming makeover. 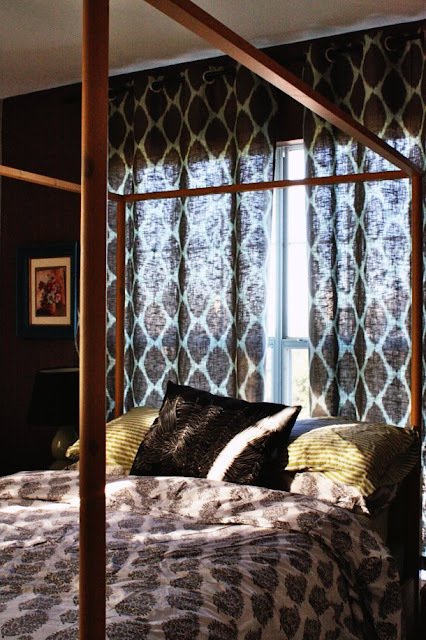 The neutral hue is an elegant complement to the yellow four poster bed. Placing the bed against a large window can create a dreamy space just like this. The bed is from Ikea. The owl bookends are from Home Goods. 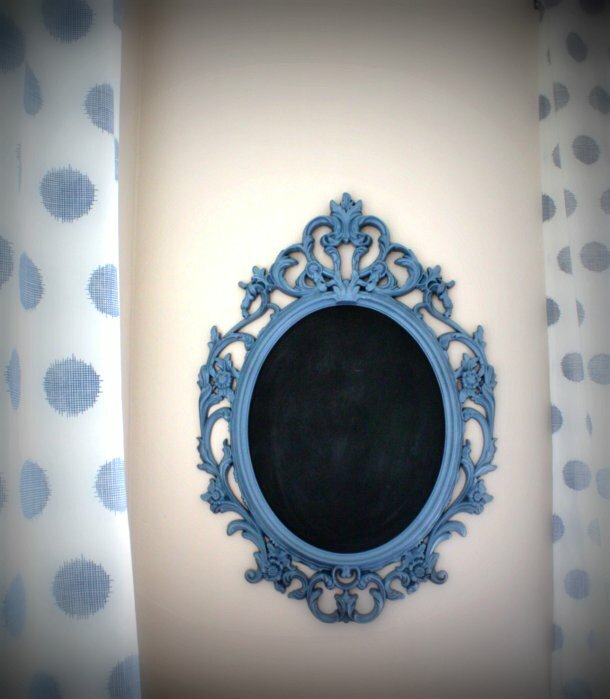 This used to be a mirror from Ikea which is now a chalkboard for to do lists. All her lacquer trays are from West Elm. Donna backed this built-in shelf with striped fabric and then used it as her bar area.